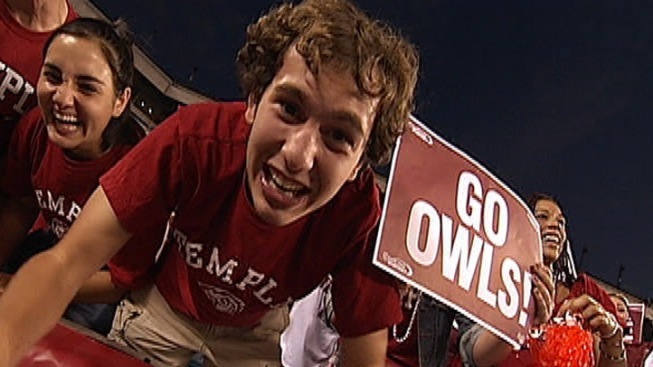 Temple fans did plenty of celebrating Thursday night. Bernard Pierce made Temple coach Steve Addazio a winner in his debut, rushing for 147 yards and three touchdowns in the Owls' 42-7 win over Villanova on Thursday night. The Owls won the Mayor's Cup -- presented to the winner of this city series -- in front of 32,638 fans at Lincoln Financial Field. Addazio inherited a Temple program in solid shape after former coach Al Golden left for Miami. Golden took the Owls from a winless season to a bowl game, and posted consecutive winning seasons. Earlier this month, Addazio, who spent the last six seasons at Florida, boldly proclaimed Temple could become the Boise State of the east. For now, the Owls can stake a claim as the best in Philadelphia. Pierce looked set to put a disappointing sophomore season behind him against the FCS Wildcats. His touchdown runs of 19 and 22 yards in the first half helped stretch the lead to 21-0 and the Owls never looked back.